What is reality? What is the meaning of life? And why do we suffer? 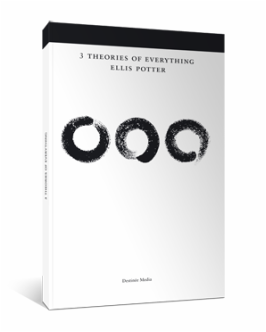 In this concise volume, former Buddhist monk and international lecturer Ellis Potter, uses clear and compelling language to explore three distinct worldviews and the hope that each one offers to humanity. Situating the reader within his own striking narrative, Potter presents himself simply enough as a young boy with questions. Throughout the book, Potter’s thoughts on these theories are punctuated by personal experiences — an honest approach that moves from one page to the next not un-like a conversation with a friend. And in this conversation, Potter articulates several characteristics of these world-views and the consequences they engender for our perspectives of everyday reality and for the ultimate purpose of our lives. Through the lens of these major views from the East and the West, 3 Theories of Everything effectively wrestles with questions of desire and suffering, examining their implications within each perspective. Potter asks readers to consider which view they would naturally identify themselves with and to think responsibly about why that is. In so doing, Potter both engages the reader with helpful big-picture information and also trusts them to relate it to their own contexts and experience. Based on lectures by the author, 3 Theories of Everything concludes with a large section of questions and answers drawn from live audience discussions that will no doubt leave the reader with a sense of recognition and plenty to think about.